RP74756 is rated 4.0 out of 5 by 2. The In2ition™ shower features a detachable handshower, which can run separately from or simultaneously with the showerhead, giving you the warmth and flexibility of two streams of water at once. Enjoy the comfort of water streaming from the showerhead position, while the handshower offers the flexibility to accomplish other tasks, such as bathing your children; washing your pet; and keeping your shower clean. When you’re finished, simply slip the handshower back into place on the showerhead. The In2ition Two-in-One Shower is a quick and easy way to upgrade your shower. Simply remove your current showerhead and replace with the In2ition shower. There’s no need to go behind the wall to enhance your everyday shower. Upgrading to a new Delta® showerhead is a great weekend DIY project. No special tools required. Innovative Pause feature allows you to conserve water while lathering up. Rated 3 out of 5 by Jfmiller from Disappointing I have had this shower head for about 1 year. The handshower will no longer stay in the showerhead. The handshower is only held in the showerhead by 3 little tabs. One of the tabs fell off so now I have to try to get a replacement. Rated 5 out of 5 by Cynth from The best I have been using this now for five months. It is the best feeling shower ever. It is everything from a rainhead to a focused flow. My grandkids use it also and I don't have to fight with them to shower! Finally a showerhead that defeats 15 year old boys. Hello, I was wanting to know if I could purchase the showerhead separately? I need the second showerhead to hold the handshower in a lower location. It will not be connected to the water supply. Does this product come with a hose? If so, how long is the hose and what is it made of? I'm looking for a metal hose, not plastic or vinyl. Is this a metal, or plastic shower head? If not, the shower head connection to the neck MUST be metal. 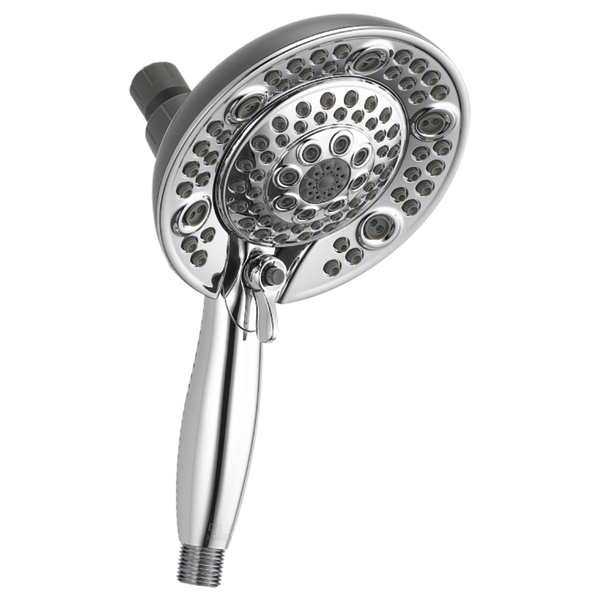 Can I get this shower head with my above specifications? what trim kit goes with this shower head? The handle filer appears to be cloged. Does it disassemble for cleaning. Soaking did not work. Hello, I am interested in using just the showerhead portion of this. Can I disconnect the handheld part entirely and just leave it on the &quot;showerhead only&quot; setting?